Welcome! We want to help demystify funeral traditions and customs for our listeners. We don't sell anything on this site. It's strictly information from the best sources we are able to identify. The Funeral Fact podcast is available free to subscribers in the Apple Podcast App, iTunes, the Google Play Store, Stitcher and TuneIn. In each episode, we explore all facets of the funeral industry as well as customs and traditions from around the world. We want to hear from you! Please send your show suggestions and questions for our guests. Thanks to Our Listeners in 50 Countries Around The Globe! Download the free planning guide here. Cryonics - Can You Live Forever? Give us your feedback! Be Part of the Show! We want to hear what aspects of the funeral industry or burial customs you are curious about. Got an idea for an upcoming show? Maybe you think you should be a guest? Yes, that is correct, this is a podcast about funerals, the funeral industry, death customs, and anything else what needs to be done when a loved one dies. Our goal is to remove the veil of mystery from the many facets surrounding death and dying. We interview leading experts in customs and traditions from around the globe to peel back the mystery and expose the truth. From different burial customs to what to expect when you call a funeral home, we cover it all. Tens of millions of people have no idea what to do when a loved one dies. In the past, funeral arrangements we taken care of by generations working together through the process. In today's fast paced world, these links to the past have been lost, in many cases. We offer real answers to the questions you have, as well as those you didn't know existed. The idea of a podcast focused on questions that people have about the funeral industry and death practices came to mind when it was clear that there was a need to provide information without selling, or having an ulterior motive. That's why we created the Funeral Fact Podcast and website — so that you will have a place to have your questions answered. 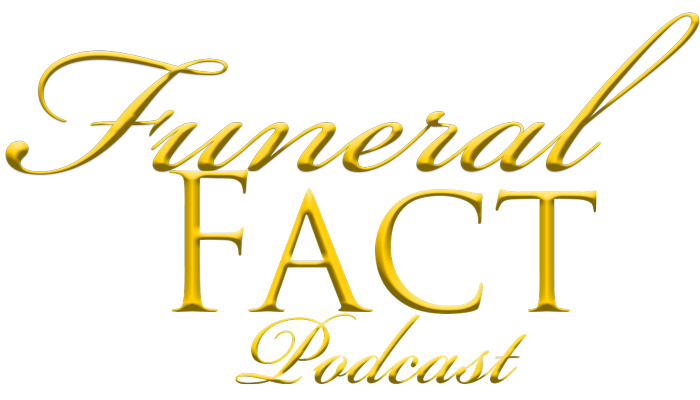 Please subscribe to the Funeral Fact Podcast using Apple Podcast or Google Play Music. If you enjoy the podcast, please take a moment and rate us on iTunes or the Google Play Music Store. What Does a Funeral Director Do, Exactly? We explore exactly what a funeral director can do for you, as well as what they can't do. Who needs to go to the funeral home? What questions should you ask? What items do you need to bring with you? All these questions, and allot more are answered in this episode of the Funeral Fact Podcast. What to Expect at a Roman Catholic Funeral? Did you know that there are more than one service involved in the traditional Roman Catholic Funeral Rites? What should you do at the funeral mass? What happens the night before the funeral mass? Just what is a funeral mass? Who can officiate a funeral mass? These questions and more are answered in this episode of the Funeral Fact Podcast. What to Expect at a Buddhist Funeral? What are the Buddhist philosophy of death? What should you expect to see and hear at a Buddhist funeral? What should you do before the funeral? Why aren't the people sad? These questions and allot more are answered in this episode of the Funeral Fact Podcast. What exactly is embalming? Why is it important? Does every person who dies need it? How long will it take? These questions and even more are answered in this episode of the Funeral Fact Podcast. What is a Natural or Conservation Burial Cemetery? What choices do you have for a cemetery burial? Can someone who has been cremated be buried in a natural or conservation cemetery? Can you be buried in a coffin if you are going to be buried in a natural or conservation burial cemetery? What happens at the cemetery? How much does it cost? These questions and more are answered in this episode of the Funeral Fact Podcast. Why would someone choose to be cremated? What exactly is the process? How long does it take? What has to happen with the ashes? Is there anyone who can't be cremated? What has to happen before a body is cremated? These questions and allot more are answered in this episode of the Funeral Fact Podcast. What are Shinto Funeral Customs & Traditions? What is Shinto? Is it a religion or more of a spiritualist belief? Do those who practice Shinto have funeral services? How is Shinto related to Akido? These questions and allot more are answered in this episode of the Funeral Fact Podcast. Donate Your Body to Science? Have you thought about donating your body to science? Want to make a difference in the future of mankind? What does it really mean? Can you have a funeral if you donate your body to science? These questions and much more are answered in this episode of the Funeral Fact Podcast. What's the difference between caskets? Do I need to buy one? Is one casket better than another? How much do caskets cost? What about Cremation Urns? What choices do I have? Should I buy a casket from a funeral home or a large retailer? Can I purchase a customized casket or urn? Can I pick out a casket in advance of my need? And much more! These questions and so much more are answered in this episode of the Funeral Fact Podcast. Private Mortuary College — Is it for you? In this episode of the Funeral Fact Podcast, host Jeff Kasper interviews Dr. Joseph Marsaglia, Chief Operating Officer for Pittsburgh Institute of Mortuary Science in Pittsburgh, PA, USA. Topics include: What's involved? Do you earn a degree? How long is the program? Do I have to go full time? Are there night classes? Can I get a student loan to help with my tuition? Exactly what classes are required or involved to earn my degree? and many more! You will gain a full understanding of what's involved and the commitment necessary to graduate from a college of mortuary science. These questions and so much more are answered in this episode of the Funeral Fact Podcast. Public Mortuary College Options — In a previous episode, we focused on a private mortuary college. In this episode of the Funeral Fact Podcast, host Jeff Kasper interviews Glenn Bower, Professor in the Mortuary Science Department for Cypress College, in Cypress CA USA. As you'll hear, there are options to furthering your education in the mortuary sciences. Topics include: What's involved? Do you earn a degree? How long is the program? Do I have to go full time? Are there night classes? Can I get a student loan to help with my tuition? Exactly what classes are required or involved to earn my degree? and many more! You will gain a full understanding of what's involved and the commitment necessary to graduate from a college of mortuary science. These questions and so much more are answered in this episode of the Funeral Fact Podcast. What are Jewish Funeral Customs & Traditions? What happens at a Jewish Funeral? In this episode of the Funeral Fact Podcast, host Jeff Kasper interviews Rabbi Jonathan Singer, who is the Co-Senior Rabbi of Congregation Emanu-El in San Francisco, California USA. Rabbi Jonathan discusses the burial customs and traditions, as well as the beliefs around death associated with the Jewish faith. Topics covered include beliefs of the Jewish faith on death, timelines and traditions associated with death in the Jewish faith, the Jewish funeral service and what to expect, burial traditions, and much more! In this Episode, Jeff Kasper reviews a list of 125 things that need to happen when someone dies. The purpose of this episode to to give you a motivation to assemble the information and documents into one place, and to have a conversation with at least one person about the location of this information and your final wishes. This list should not be considered comprehensive nor should it be construed as legal advice. However, it is a good place to start your planning and discussions of your final wishes. You can download a copy of the list here. What happens at a Lutheran Funeral? In this episode of the Funeral Fact Podcast, host Jeff Kasper interviews Reverend Doctor Daniel Storvick, Pastor Emeritus of American Lutheran Church in Prescott, Arizona USA. Dr. Storvick discusses the burial customs and traditions, as well as the beliefs around death associated with the Lutheran faith. Topics covered include beliefs of the Lutheran faith on death, timelines and traditions associated with death in the Lutheran faith, the Lutheran funeral service and what to expect, burial traditions, and much more! Have you ever wanted to visit a famous person's grave? In this episode of the Funeral Fact Podcast, host Jeff Kasper interviews Theodore Hovey, Family Service Counselor with the Hollywood Forever Cemetery/Beth Olam Cemetery/Hollywood Funeral Home in Hollywood, California, USA. Mr. Hovey discusses the etiquette for visiting a famous cemetery or gravesite, how you could spend eternity near your favorite celebrity, shares some interesting tales of popular graves, and much more! In this episode of the Funeral Fact Podcast, host Jeff Kasper interviews Dennis Kowalski, president and chief executive officer of The Cryonics Institute. Topics include: What is Cryonics? How much does it cost? Will I be able to live forever? Is this a replacement for embalming? Can my family come visit me when I'm frozen? Will I be really frozen? What about frostbite of freezer burn? Will this really work? And much more! In this episode of the Funeral Fact Podcast, host Jeff Kasper interviews Matt Smith, a licensed funeral director and embalmer from Michigan, USA who has earned a reputation as one of the top restorative artists in the world. Topics include: What is restorative arts? How do you know what someone should look like? High-profile cases? And much more! What's Involved in Pre-Need Planning & Insurance? In this Episode, Jeff Kasper (CA Insurance Lic. #0L49867) reviews how you can plan for your final arrangement in advance. Jeff also discusses how to fund your final arrangements, as well as how to plan for other expenses such as a reception, flowers and permits and other government fees. You can download a copy of the Pre-Need Planning Guide here. Listener Questions. In this Episode, host Jeff Kasper (CA Insurance Lic. #0L49867) opens the "email bag" and answers listener questions. From is there a funeral convention to why haven't you done an episode on Muslim funeral and burial practices, plus allot more! John shares the burial customs and traditions associated with traditional Hawai'ian beliefs. Topics covered include beliefs of the Hawai'ian people on death, timelines and traditions associated with death, the Hawai'ian funeral service and what to expect, burial traditions, and much more!